You can quilt two, three or more quilts per day! Machine Quilting Myth #2 is a “sister” to Machine Quilting Myth #1. The reasoning goes that if it takes only an hour or two to quilt a quilt (Myth #1), than you should be able to quilt three or more quilts per day. Please, DON’T BELIEVE THIS! If you read the comments to Machine Quilting Myth #1, you will quickly realize that it takes MUCH longer than two or three hours to complete a quilt on a quilting machine. Can someone quilt more than one quilt per day? Yes, it can be done and I have done it. But … what is being quilted and what is the quality of the quilting.If the quilts are small, such as baby size quilts to a twin size quilt, you could do two per day, but I would think that the quilting would be more all over, edge to edge or pantograph work. Not that any of these techniques are “bad”, they are usually less time-consuming than custom work. If the quilts are smaller and are using the same backing fabric, I’ll either put both quilts onto the quilting machine at the same time. Or, I’ll measure, then mount the backing fabric on the machine for the two quilts, Then I’ll put the first quilt top on, quilt it, and then put the next quilt top on below the first quilt and continue quilting until finished. (Both quilts will be rolled onto the take up roller.) If these quilts use different backings, then they need to be on the machine individually. But other questions that this myth raises are – Do you REALLY want to be quilting more than one quilt per day? Let’s assume that the quilts are not small, but larger, maybe larger twin to king size. Do you want to be under pressure to quilt two (or more) large quilts per day? What kind of toll will be paid to your body, your mind, and your sanity if this pace is continued for a short while? Or over a long period of time? Will you have a life or time for family, friends or your community? Will you have time to complete your own quilts and projects? Have you every completed two or more quilts in one day? If yes, what were their approximate sizes and what did you quilt on them? These answers don’t need to be specific, especially if you did this a while ago. If you do quilt more than one quilt per day on a reasonably consistent basis, what sizes are the quilts (approximate) and what do you usually quilt on them. Do you “group” the quilts together on one backing or do you mount each quilt individually on the quilt machine? If you have any other comments on this topic, please post them. I know we all learn a lot from what others have to say. You can quilt a Queen Size quilt in two hours or less! I know that there is advertising and an attitude “out there” that says you can quilt a queen size quilt on a longarm quilting machine in two hours, maybe less. DO NOT BELIEVE THIS! Is it possible to do this? Yes, it can be done, BUT… the quilting is minimal, usually large, all over, ugly (in my un-humble opinion) big stipple with only one color of thread. Personally, have I quilted a Queen size quilt in two hours, no; in less than three hours, yes I have. The quilt was for a charity (which means I was doing it at no cost), the quilt top wasn’t spectacular and my quilting was an all over free hand design that had enough stitching to make the quilt look pretty good and hold it together. Is this the type of quilting I normally do on my customer’s quilt, no! Most people become interested in machine quilting because they want to enhance the piecing of the quilt and want to quilt more complex designs such as feathers, cross hatching, and other types of quilting designs. There may be a few people who want to “get ‘er done” quickly because they have a lot of quilt tops that are waiting to be finished but most of the people I talk to want more quilting than big,all over stipple. If you are thinking of purchasing a longarm quilting machine to start a business, be realistic about how long it actually takes to complete a quilt with a moderate amount of machine quilting on it. What is the average length of time it takes you to quilt a Queen Size quilt (approximately 80 x 98 inches) with a moderate/medium density quilting? Include the time it takes to load the quilt to the quilting machine and for any trimming of threads when the quilt is completed. Do not include the time needed to bind the quilt. A Queen size quilt with medium density quilting, from start to finish (no binding) takes me about 6 hours to complete. It will be interesting to hear from other quilters. Welcome to the Machine Quilting Business Blog. 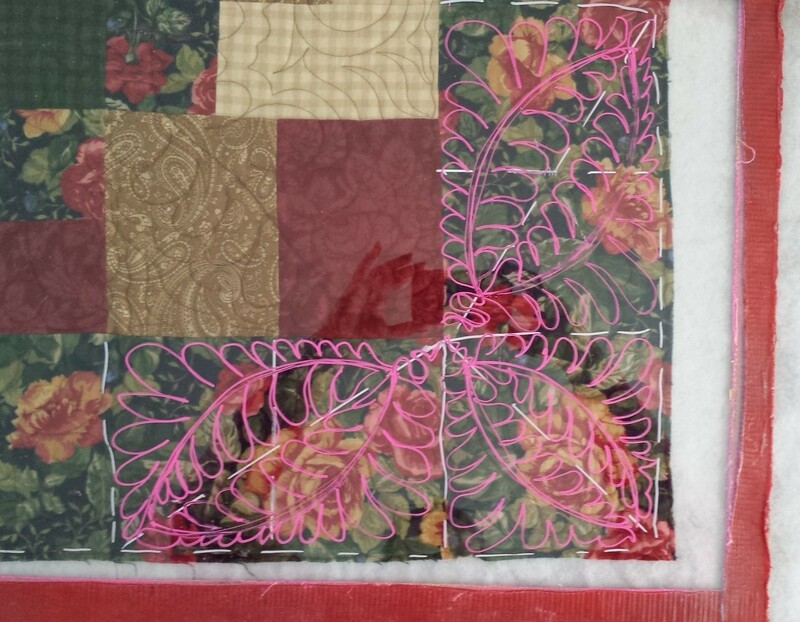 No matter if you have been a professional machine quilter for a long time or just getting started on my professional machine quilting journey, I hope this blog helps you along your way.